The crisis in the Church continues. 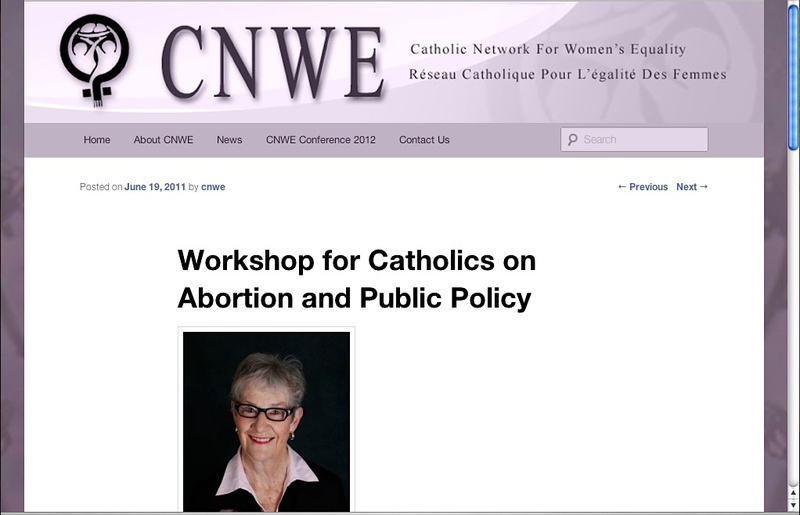 One example is the so-called dissident outfit entitled: "Catholic Network for Women's Equality" (CNWE). As a background sample of this CNWE's dissent, Rosemary Ganley, - a long-standing member of CNWE - last June 11, 2011, gave a "workshop" on abortion in New Brunswick. Ganley, a "feminist" theologian is also a member of "Catholics for Choice Canada". Rosemary Ganley, volunteer for "Catholics for Choice Canada"
Incredibly, just a few weeks ago, Sr. Caroline Dawson (Institute of the Blessed Virgin Mary), addressed this dissident group at Loretto College, a university residence owned and operated by the Order (also know as Loretto nuns) and affiliated with St. Michael's College, University of Toronto. It would seem that the CNWE has used Loretto College more than once. Some further background information on Sr. Dawson's dissident activities may be found here. It is not unreasonable for the Archdiocese of Toronto to (at minimum) request that these nuns not allow dissidents to speak on their property. Canon Law provides a wide scope of action for the local Ordinary vis-a-vis religious orders. Catholics in the Archdiocese should consider contacting His Eminence, Thomas Cardinal Collins, regarding this matter. Cardinal Collins is also Chancellor of St. Michael's College, University of Toronto. This is not at all clear. I could not get to the web page illustrated here. A link pointing to a smoking gun might be helpful. The smoking gun link has been added. I believe what happened is that in my editing, a link was changed.